About Us - AB Garcia Construction, Inc.
AB Garcia Construction, Inc. (ABGCI) is a fast growing construction company that promises quality, value, elegance and safety to its customers. It does these by adhering to the highest level of integrity and professionalism in its application of sound construction and engineering standards and principles. ABGCI has been in the industry for 13 years since 2000 with focus on design and construction of medium rise commercial buildings and high-end residential houses. It has built a successful track record of projects and developed expertise in general construction, architectural design, construction management, structural design, construction supervision, detailed civil works, and more. Its success in the industry is recognized by different institutions and media outfits. 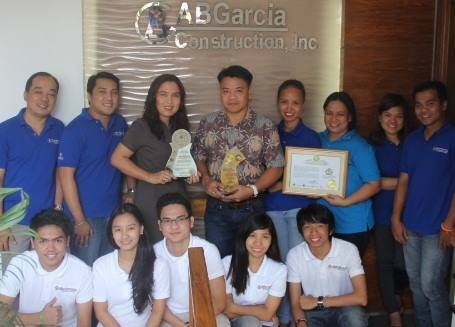 ABGCI was awarded “Best Design and Construction Company” by Top Brand Philippines and “Most Outstanding and Efficient Companies” in the field of construction, urban planning, design, and architecture by Europe Business Assembly of UK. Different media outfits namely GMA7, TV5, and ANC/ABS-CBN Realty TV also validated ABGCI’s expertise by inviting the company to be the Industry Resource in the subject of construction and design. ABGCI is managed and run by a dynamic team of highly qualified, experienced, and upright professionals in the fields of engineering, architecture and construction. The team is effectively led by Engineer Arnelito B. Garcia, President and Chief Executive Officer. We envision ourselves to be one of the best global construction companies in terms of quality, design, and service. To our customers: We exist to delight our customers by building houses that will soon be their homes and buildings that will soon be part of their investments. Customer delight will come by ensuring excellent quality at reasonable prices, elegant designs, and superb customer service. To our employees: We will develop our people by providing competitive compensation, continuous training, and providing opportunities for growth. To our shareholders: We will ensure very good profitability and growth for the company. To our environment and community: We will better the environment and community we live in. We will do this by promoting green architecture, recycling, waste management, and applying innovation. To our partners: We will add value to our partners by promoting win-win partnerships.